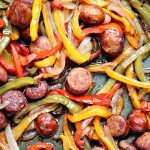 This recipe is perfect for busy nights where you want a delicious meal in a snap. It’s incredibly easy to make and full of flavour. Whip up some Tortilla Pizzas with Roasted Red Peppers today. This is a sponsored post for Tyson Foods, Inc. All opinions are my own, as always. Thanks to all the companies, and readers, who help support my blog. There is nothing that makes me happier than a good excuse to whip up pizza. 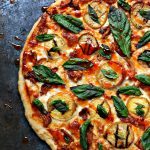 Having a quick pizza recipe in your repertoire is essential for holiday entertaining, and pretty much year round. What I love about this recipe is how versatile it is. I make it often when we have company for brunch. It’s quick and easy, plus you can customize the recipe to each person’s tastes. 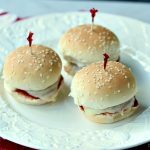 We also make this as an appetizer recipe for parties. You can just cut it into small pieces and it becomes finger food for all your guests. They will love you so much for making this. For me pizza is the ultimate comfort food. It’s a people pleaser, it can feed a crowd and it puts a smile on anyone’s face when you serve it. 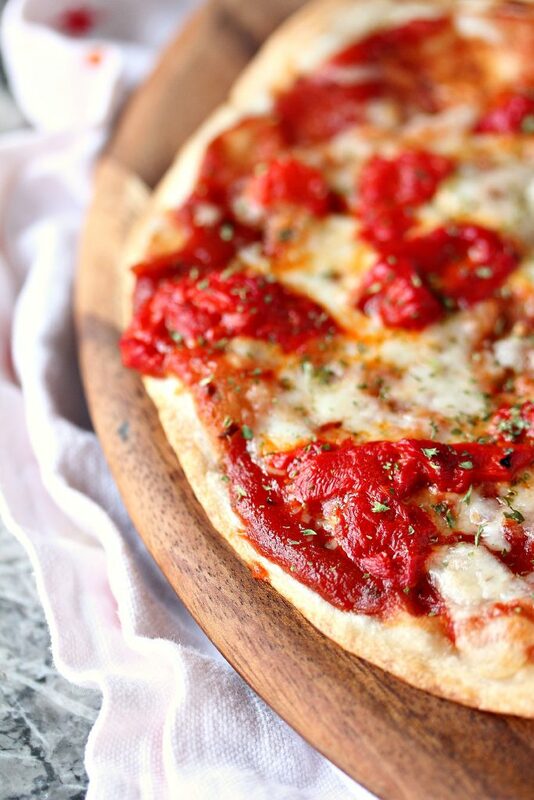 Pizza is the perfect party food. I’m a thin crust girl, so making pizzas using tortillas makes me super happy. I get the best of both worlds. The tortillas cook up perfectly. Crispness in every bite. You can pick up the perfect tortillas at Costco. That’s where we buy ours. There’s a brand called TortillaLand and I’m telling you right now they are amazing. They are uncooked flour tortillas so they are as fresh as can be. You slide them in a hot pan and voila, perfectly cooked tortillas every single time. I dig that. It’s incredibly cool to watch them puff up as they cook. You don’t need oil, just a hot pan. TortillaLand describes them as “Fresher Tasting Tortillas”, and I agree wholeheartedly. I’ve teamed up with TortillaLand to give one reader a chance to win a $50 Costco Gift Card! I know right, how cool is that. Who couldn’t use a Costco Gift Card this time of the year. Swing by Costco to pick up the product and share your recipe by January 1, 2016. We want to see your creations using TortillaLand products. Shout out your favourite recipe using TortillaLand flour or corn tortillas in the comments on the blog post. Or better yet, share a photo of your creation with us. Swing by my Facebook page to drop a photo after leaving a comment here on the blog post and you’ll be entered for your chance to win a $50 Costco Gift Card. I hope you enjoy celebrating with these Tortilla Pizzas with Roasted Red Peppers this holiday season Use #tortillalandholiday on social media to share your own creations. This recipe is perfect for busy nights where you want a delicious meal in a snap. It's incredibly easy to make and full of flavour. 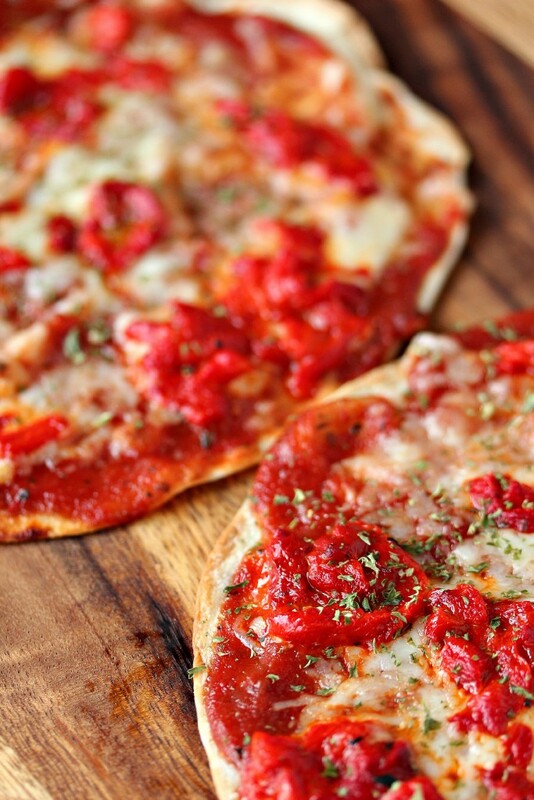 Whip up some Tortilla Pizzas with Roasted Red Peppers today. Place 2 large cookie sheets near your work station. Heat 8 TortillaLand flour tortillas in a pan according to the package directions.Place cooked tortillas on the cookie sheets. In the same pan you cooked the tortillas in heat up 1 tablespoon of olive oil. Pour the roasted red peppers into the pan and cook over medium heat, stirring occasionally until the peppers just start to crisp on the edges. This takes about 3 to 5 minutes. Either chop them into pieces by hand or toss in a food processor and pulse briefly. You want them to still be chunky pieces, so chop them roughly, or pulse them briefly. 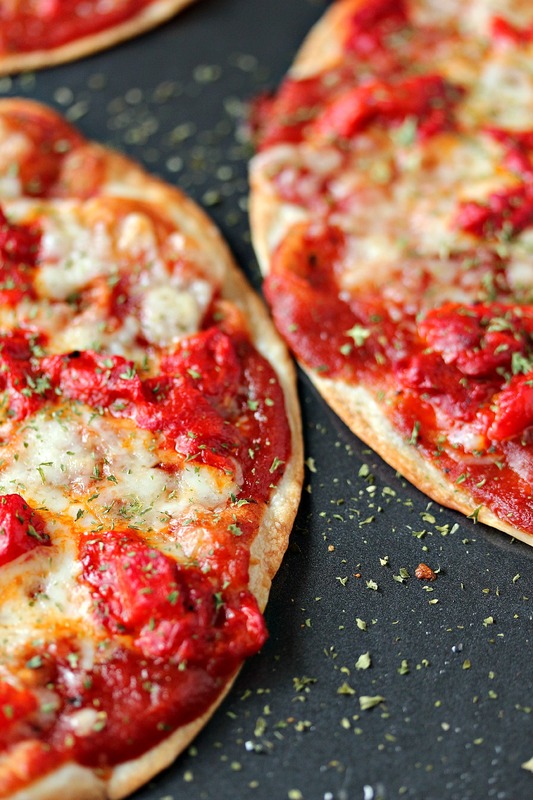 Using tongs place the roasted red peppers randomly around the tops of the tortilla pizzas. Place the cookie sheets in the oven and cook for about 5 to 7 minutes, you just want to cook them long enough to melt the cheese properly. Remove from oven, toss parsley over top. Serve with a big old TortillaLand loving smile! 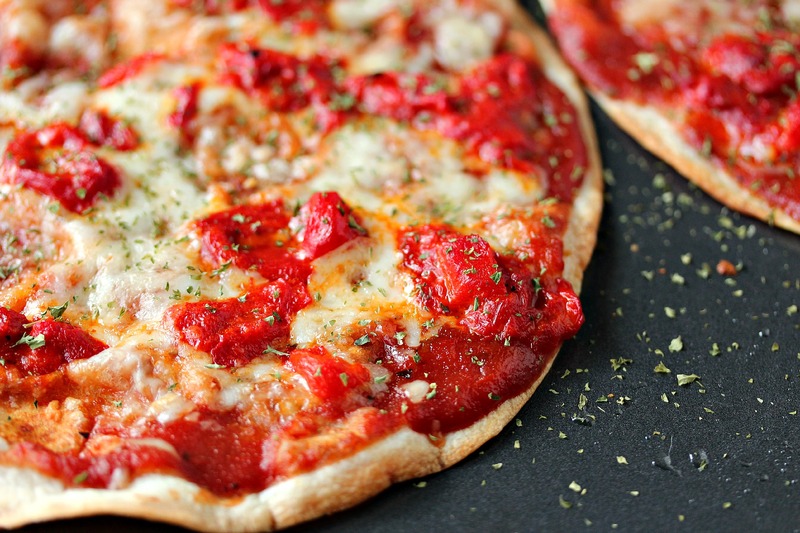 These are just the prettiest tortilla pizzas I’ve ever made. There’s nothing like fresh tortillas when cooking up something fabulous. It makes all the difference in the world. Whip some up today. Thank me tomorrow. 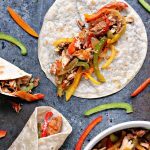 To enter for your chance to win just leave a comment stating your favourite recipe you make using TortillaLand tortillas. Better yet, snap some photos and tag me (@cravingsofalunatic) on Facebook or Instagram. Follow the prompts in the rafflecopter to enter for your chance to win!! 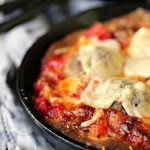 Be sure to check out my recipe index for more pizza recipes, or check out my Lightened Up Enchiladas. You can also follow me on Facebook and Instagram to keep up with all the latest recipes on Cravings of a Lunatic. I’ll be making a version of these for dinner tonight, I try to make 3 or 4 different versions. Great idea. It’s US only. So you’re totally good. I like to use tortillas to make chicken tortilla pinwheels. I love so many! Chicken enchilada casserole, flautas and chicken bacon avocado wraps r at the top of the list. Holy moly- those look absolutely delicious! I have never tried this, and now I am adding it to my list. I am a good old crispy quesadilla kind of girl. The variety is endless! I like to make mine into chips! I would make carmelized onion chicken and cheese quesadillas! Love this! 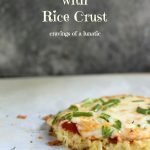 I used to make tortilla pizzas as an after-school snack all the time when I was a kid… all the goodness of pizza, but ready in just a few minutes. I haven’t seen this particular brand of tortillas at my local Costco, but I’ll definitely keep an eye out for it. Love this idea. Thank you for sharing with us at #HomeMattersParty.See you again next week.